Move beyond "beginner" status and take your quilty skills to the next level. Quilting 201 is perfect for students who have completed Quilting 101, or beginning quilters who are familiar with sewing a ¼” seam. Join Meg Fahrenbach in this 8-week course as we continue our adventure into the craft of quilting through the construction of Meg’s original quilt pattern, A New Day. The quilt is made up of (9) large blocks that sew up fast to create one gorgeous 72" x 72" quilt. This class will focus on following a more advanced pattern under the guidance of the instructor. Fine tune your cutting and organizational skills while working on a multi-block quilt. 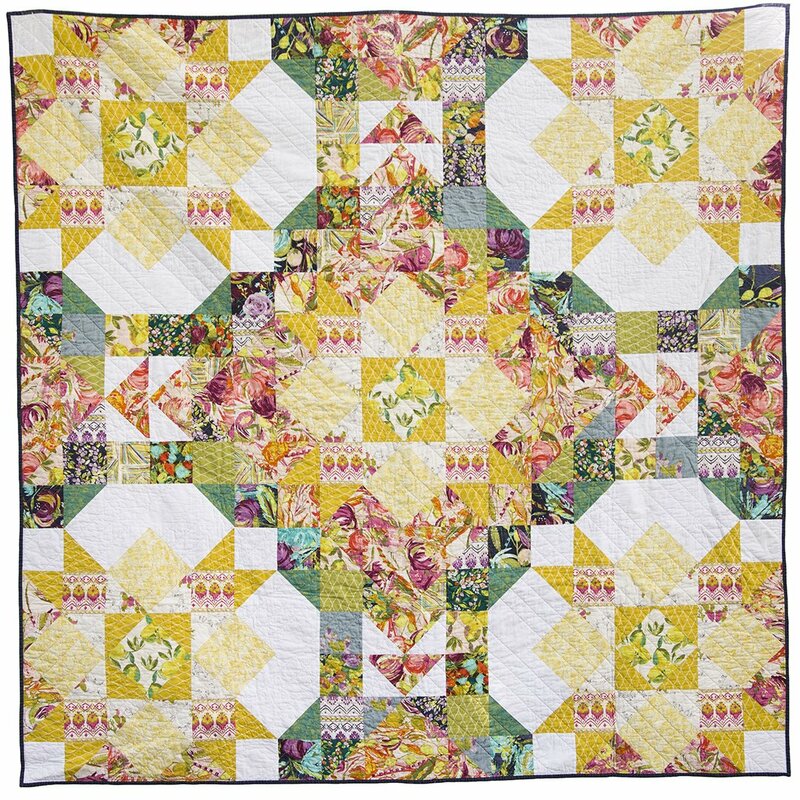 Students will learn how to make multiple Half-Square Triangles and Flying Geese at a time to speed up the quilt making process, as well as assemble these units into larger, more dynamic quilt blocks. * These cuts can be achieved with the listed requirements only if done very precisely with a WOF of at least 42 ½”. Please purchase more fabric if you prefer to have more wiggle room. ** Just over 1/8 yard of each of the 9 fabrics is used, so you will have material left over. Charm squares/precuts are also an option for these patchwork squares. Sticky notes/index cards and Ziploc bags to organize cuts and blocks.